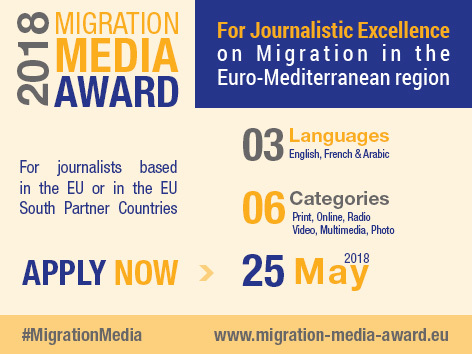 The 2018 edition of the Migration Media Award is now accepting applications until 25 May 2018. The awards will consist in funding from 750 to 7000 euros towards the production of a second story. The Migration Media Award (www.migration-media-award.eu) funded by the European Union, hosted over 35 winning stories in the 2017 edition showcasing journalistic excellence on migration in the Euro-Mediterranean region. In line with the quality and number of applications received last year, this year’s edition will reward up to 48 published stories resulting from time-intensive, un-sensationalistic, in-depth reporting and contributing to balance the narrative on migration, making it, evidence based, nuanced and less polarising. The awards will consist in funding from 750 to 7000 euros towards the production of a second story. Candidates who wish to apply must respect the following criteria: The submitted story must have been published between 15 April 2017 and 25 May 2018. The content of the entry must be related to one of the four themes mentioned above on migration limited to the Euro-Mediterranean region. The entry must be submitted in one of the 3 languages of the Award scheme: English, French or Arabic. Stories in other languages from the Euro Mediterranean region must be accompanied by a translation into either English, French or Arabic. Multiple entries are accepted in separate and complete applications in the following formats: video, radio, print, online, multimedia and photo. Mid to long length formats are requested and therefore short news items will not be eligible. Please note that candidates may not submit a story already supported by the MMA 2017. The MMA panel of judges will be announced in May 2018 and will evaluate the eligible entries in Summer 2018. The 48 winners will be announced at the award ceremony planned in early September 2018. The online application form and FAQs are available at www.migration-media-award.eu . Interested applicants should check the Eligibility & Application section prior to applying. In case of any questions, kindly contact us on : contact@migration-media-award.eu . 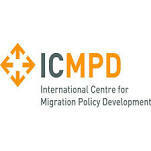 This award is a collaboration of the Directorate-General for Neighbourhood and Enlargement Negotiations (DG NEAR) funded programs Euromed Migration IV implemented by the International Center for Migration Policy Development (ICMPD) and the Open Media Hub led by the Thomson Foundation, in partnership with the Ministry for Foreign Affairs and Trade Promotion of Malta and the European Asylum Support Office (EASO).